US swimmer Ryan Lochte will not be responding to Brazilian police charging him with making a false statement, his lawyer says. The charge relates to a claim he made that he and three team-mates had been robbed during the Rio Olympics. 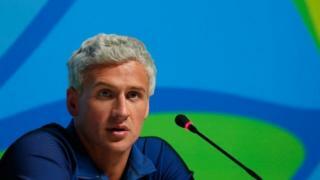 Asked whether the swimmer would be making a public statement, his lawyer told the BBC he would "not be". The story began when Mr Lochte said he and three fellow swimmers had been robbed at gunpoint in a taxi by men with a police badge as they returned to the Olympic village from a party. But the police say he made up the story and officers produced video evidence that the group were actually challenged by security guards after they had vandalised a petrol station toilet. He has admitted he was drunk and apologised but he now has to decide whether or not to return to Brazil to answer the charges. Several sponsors, including clothing manufacturer Speedo, dropped the swimmer in the wake of the incident. But one company, Pine Bros Softish Throat Drops, signed the athlete up, saying people should be more understanding and that he will use the campaign slogan "Forgiving On Your Throat" in an advert. When filing the charges, Brazilian police also recommended courts issue Mr Lochte with a summons.